Computer Systems Validation is the most comprehensive guide on computer validation currently available, containing more than 200 illustrations and more than 100 tables. Computer Systems Validation reviews regulations and their development, organization responsibilities, validation life cycle based on GAMP4 Guide, strategic approaches to validation, electronic records and signatures, handling regulatory inspections, metrics, and opportunities for performance improvement. 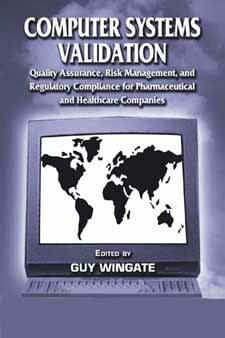 Computer Systems Validation presents practical examples and checklists throughout the book and explores the role of quality assurance and risk management as key components of pragmatic regulatory compliance. Covering methods that help you avoid duplicating effort among departments and business functions, the book demonstrates how you can use your investment in technology to improve business efficiency and gain the competitive edge.